Limits are set in a number of different units – microgrammes of ethanol in air (µg/100ml), milligrammes of ethanol in blood (mg/l) and BAC% (Blood Alcohol Content) are all common terms; they are no different to measuring the weight of something in say grammes, kilos, pounds, stones etc. What is the drink drive limit in England & Wales? England and Wales has the highest drink drive limit in Europe. The legal limit for alcohol levels in the body while in control of a vehicle in England and Wales is 35µg (microgrammes) of ethanol in 100ml of breath. This is also expressed as 80mg of alcohol per 100ml of blood or 0.08% BAC (Blood Alcohol Content). What is the drink drive limit in Scotland? Scotland reduced their drink drive limit to 22µg/100ml in December 2014 to bring them in line with most other European countries. This is also expressed as 50mg of alcohol per 100ml of blood or 0.05% BAC (Blood Alcohol Content). Why is the English and Welsh drink driving limit higher than the rest of Europe? Good question! In our opinion, it is a long way from representing a level where someone is not impaired whilst driving. Below is a map of Europe showing the various drink drive limits that apply. For those involved in the transportation industry, much stricter drink drive limits apply. In principle aircrew, maritime and railway employees are all subject to a limit that is just one quarter of the normal drink drive limit, 9µg/100ml. It is generally accepted that the ‘zero impairment’ level (the point above which alcohol starts to impair a persons’ judgment, reaction times and co-ordination) is 9µg/100ml. Most European countries set this as the maximum level for any form of commercial work, be that driving, flying or operating a ship. 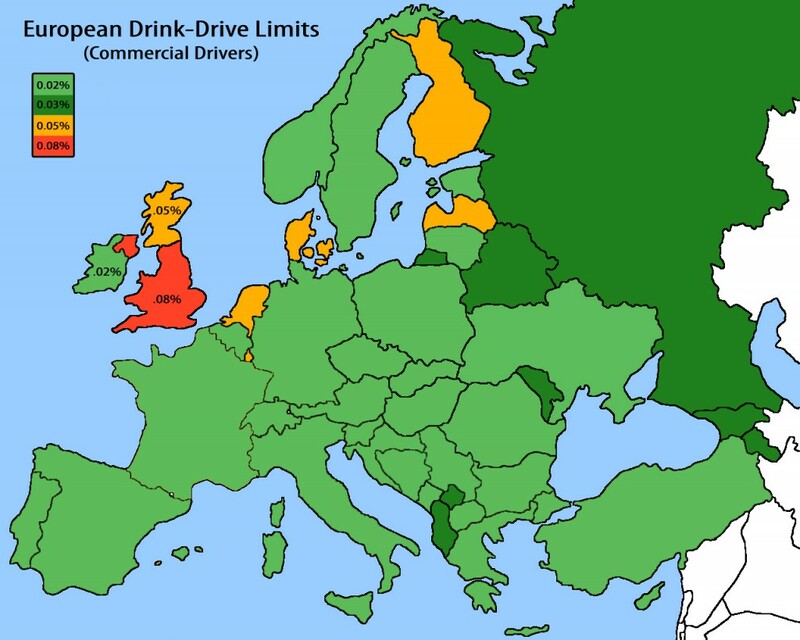 Below is a map of Europe showing the various commercial drink drive limits that apply.